It seems like all the kids we know are all turning 2. With that in mind, here are 7 educational toy ideas for toddlers. Most of the age ranges on these toys fall within 1-3 years. We worked to keep these gender neutral as well. This toy is a great option for little ones to help them learn their letters. 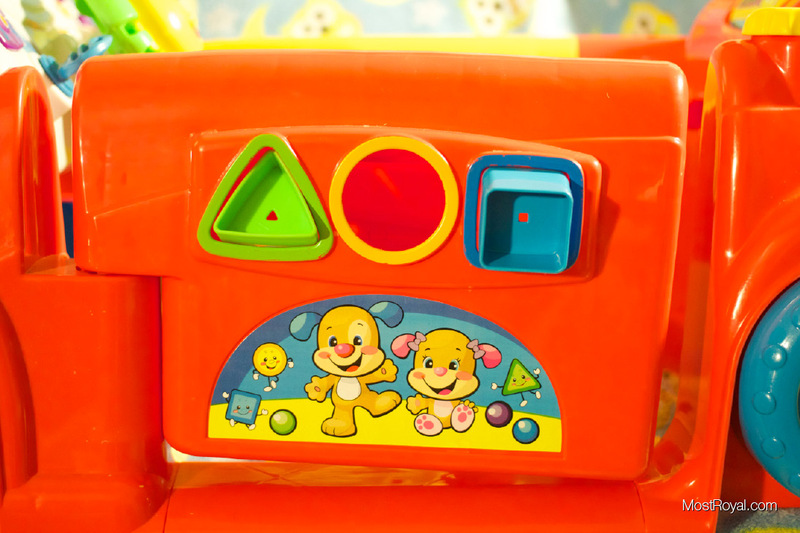 The toy is a puzzle where the letters fit into their designated slot, and below each is the image of a word that starts with the corresponding letter. At the bottom of the board is a slot that can fit 3-4 letters to spell simple words. All of the letters fit back into their spots and the whole case fold closed with handles for easy on-the-go transport. This is a very interactive toy for ages as young as 12 months. The chair can be programmed to match the age of your child, from the simple concept of “up and Down” at 12 months, to more imaginative play from 24 months and up. It has songs, a remote, says phrases, and includes a book to flip the pages. The fact that this chair grows with the child and adapts to their new abilities, makes it a great option for any toddler. This toy tablet offers 8 activities for your toddler to play with. From a keyboard for playing music, to learning letters, numbers, and matching this toy packs a lot of options into a smaller package. We always have mixed feelings on these digital noise making button pushing toys – but this has always proven to be a popular best seller so we wanted to include it. All toddlers love to hammer (our little boy does, at least!) This toy offers them endless hammering fun, teaching coordination and colors. As you hammer down one peg the opposite peg begins to rise. I love this idea as it helps to avoid the meltdowns we have encountered on similar toys that need to be manually reset. This car is a great toy that grows with your child. Starting out early at 6 months it teaches the most simple of concepts (open/close) and grows to pretend play (let’s drive to the zoo!) From sitting/crawling, to walking/climbing, this toy really is fun for all ages. We wrote a full review of this when our tyke hit one year and it’s still a winner now that he’s two. This is a fun book with 10 pictures on each page for you to teach and then quiz your child. Photos are of everyday items that they would see outside (animals, vehicles) to inside (bath time, mealtime, toys.) Something your child will have fun flipping through and pointing out the pictures they know. Make sure to also check out Roger’s other bestseller books in this series: First 100 Animals & Numbers Colors Shapes. The good Ol’ See ‘n Say. This toy has been around for ages and stays a great classic. Kids love to pull the lever handle and see the cause and effect of arrow spinning in the center. Which animal will it land on? What sound does the animal make? Tons of fun for toddlers and nostalgic for adults.